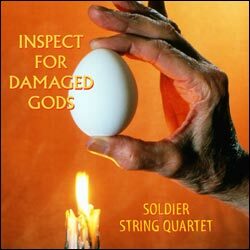 The Soldier String Quartet including the brilliant jazz violinist Regina Carter, the contemporary classical violinist Todd Reynolds, violinist Dave Soldier, violist Judith Insell, and cellist Dawn Avery and featuring the singers Tiye' Giraud and Jimmy Justice. They are joined by guest artists singer Laura Cantrell, drummer Jonathan Kane, bassist Richard Bona, violinist Rebecca Cherry, accordionist Anne DeMaranis, and percussionist Valarie Naranjo. The pieces include originals by Dave Soldier, and his arrangements of tunes by Robert Johnson, Bo Diddley, Raymond Scott, Sly Stone, and Robert Pete Williams.